The Dialog Setup Maintenance page in Enterprise Server 9 is used for adding metadata properties to dialog boxes and for adding query parameters to various locations in Smart Connection and Content Station. Figure: The Dialog Setup page. The Dialog Setup Maintenance page appears. 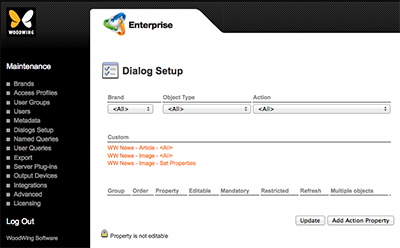 Note: When dialog setups are managed, the page title will read 'Dialog Setup'. When query setups are managed, the page title will read 'Query Setup'. The top of the page allows you to filter the page to show only those items that you are after. The Custom section of the page shows the created setups based on the selected filter. The section below the Custom section shows all properties that are part of the displayed group (if any). The bottom of the page contains the option to update created setups or add properties to a setup.